Giveaway Winner for Crazy About Chocolate! 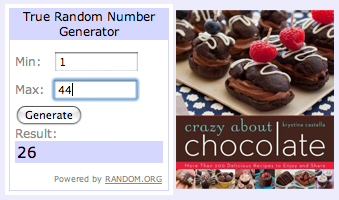 Congratulations to commentor #26, Andrea D., for winning Crazy About Chocolate! Andrea loves chocolate chip cheesecake and is also an email subscriber–thanks for following, Andrea! Hope you find lots of yummy things to make in this cookbook! I’ll be contacting you soon to get your mailing information and pass that on to the publisher, who will be mailing your copy directly to you! This entry was posted in Giveaways on December 3, 2013 by nancyc.